President of the Republic of Azerbaijan Ilham Aliyev has met with Speaker of the Parliament of the Republic of Croatia Gordan Jandrokovic. President Aliyev and Speaker Jandrokovic posed together for photographs. 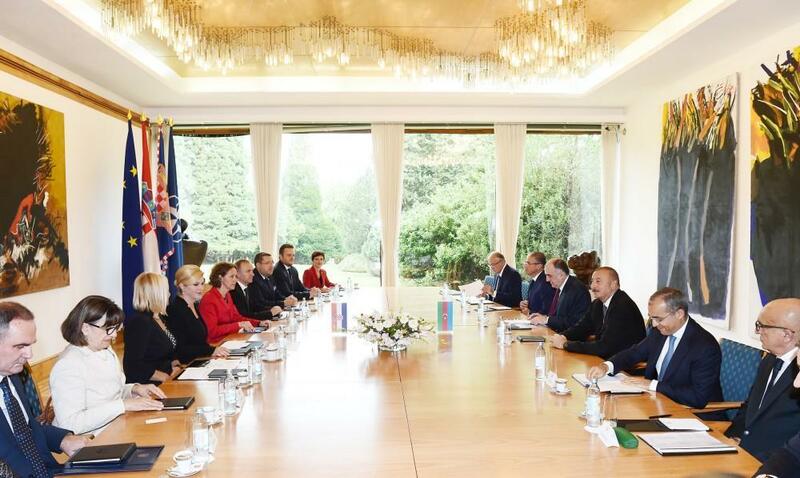 The Azerbaijani president’s official visit to Croatia was hailed as successful, and the sides emphasized fruitful discussions held during the visit. The development of strategic partnership ties and successful cooperation between Azerbaijan and Croatia in political, economic, energy and other areas was stressed at the meeting. The importance of increasing trade turnover was underlined. Azerbaijan’s role in energy security of Europe, the importance of the Southern Gas Corridor were pointed out. It was said that high-level reciprocal visits play a special role in expanding the bilateral relations. The importance of Azerbaijan's participation in the Resolute Support mission in Afghanistan was highlighted, and Azerbaijan's successful cooperation with the European Union was hailed during the meeting. The sides emphasized good opportunities for cooperation between Azerbaijan and Croatia in transport, pharmaceutical and tourism spheres. The sides noted the importance of expanding inter-parliamentary relations, and emphasized that friendship groups can make a significant contribution to this. Other issues of mutual interest were discussed during the meeting.